Tons of stuff happening over here at TRH World Headquarters. Hoodies with our “Shield Logo” will be in next week or so. We’ve also been getting elbow-deep in trying to get awesome beers in house, resorting to driving to different breweries and getting it ourselves (yes it’s all legal…I had to get a special endorsement on our liquor license to make sure the Guvna gets the taxes…doh). Two weeks ago we were the first to bring in Two Beers Brewing, a 1-year old brewery out of Seattle, and their delicious Echo IPA (we’ll soon have their 20/20 Blonde, the most amazing blonde beer I have ever tried). Joel hand delivered his beer that he brewed himself, and we got to talk beer in the early morning hours of opening up TRH. Great guy, great beer. The keg went in 3 days. To keep the ball rolling, we’ll be first in town to bring in Chuckanut Brewing from Bellingham, WA, and their amazing Rauchbier. Chuckanut is the new project of Will & Mari Kemper, from Thomas Kemper Brewing, the first craft brewery beer I had in Washington State (Poulsbo) back in 1992. So stoked. 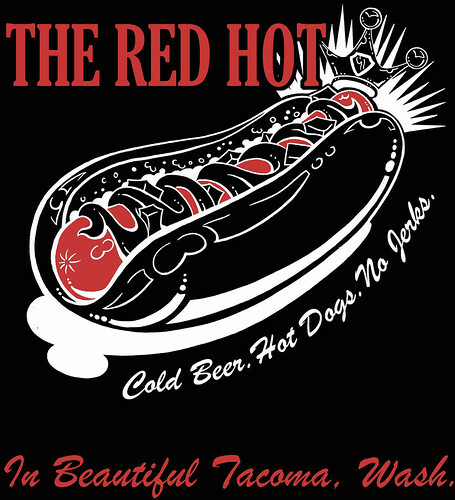 www.redhottacoma.com/www.beerandhotdogs.com will be up and running very soon. And finally, this Sunday is the first Sunday TRH will be open for business. Our new Sunday hours are from 1pm to 10pm. Yessss.